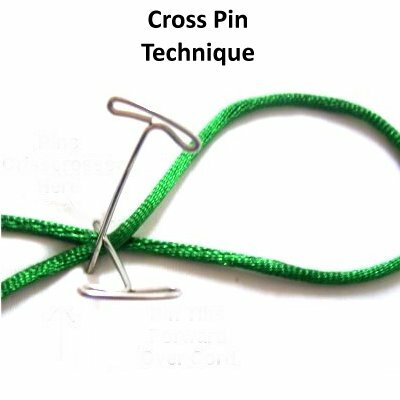 Description: The Cross Pin Technique is a unique way of securing delicate materials to a project board. Leather and Satin, for example, are materials used in Micro-Macrame jewelry designs. They are both easily damaged by pins. By securing the cords with this technique, you don't have to worry about harming the fibers. 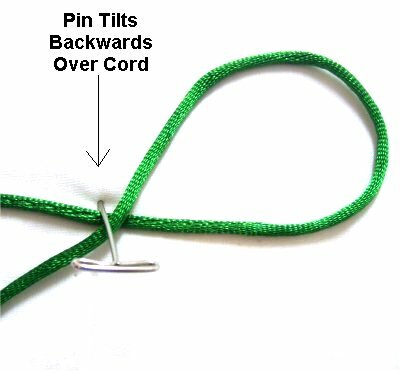 Step 1: To practice this technique, you need a piece of scrap cord large enough to make one loop. 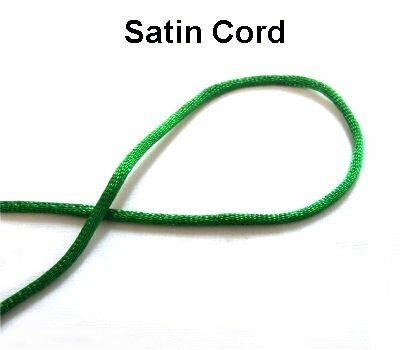 Satin Cord is shown in this example. Create the loop so one end crosses over the other. Step 2: Place one pin just above the crossed area. Tilt it so it leans backward (down), heading towards you. Make sure it passes over both segments at the crossing point. Step 3: Place a second pin below the crossing point. Tilt it so it's leaning away from you, in the opposite direction of the first pin. The two pins should CROSS. The closer the pins are placed to the cord, the tighter the hold will be. You can use this technique at any place on the loops, not just at the crossing points. So practice using the technique again, placing it on the crook of the loop, which is the rounded portion. 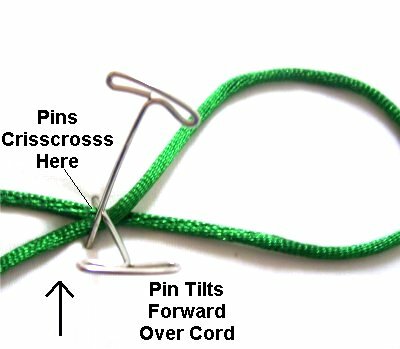 This is also a great way to secure knot designs that have been doubled, so you don't end up with a large number of pins. So practice this technique with more than one cord, too. Have any comments about the Cross Pin Technique? Contact Me.